We all love our pets, but sometimes love’s just not enough to keep us from forgetting to pick up pet food. At times we’re just so busy, or really tired, and it would be terrific if someone could take care of this for us, especially if there is no charge for this convenience. 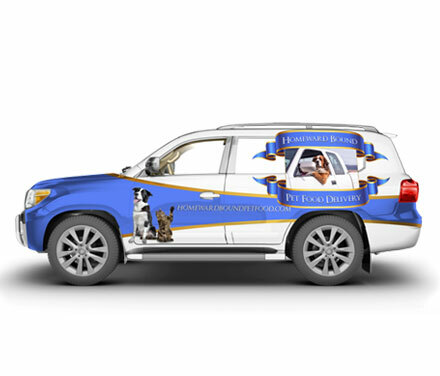 At Homeward Bound Pet Food Delivery it’s easy, free, and reliable! Our Premium, nutritious, grain-free, health enhancing, and balanced-diet cat and dog foods taste great as well! To Get Started and have your pet’s food delivered free of charge (we’ll even lug it down to the basement if that will help), just connect with one of our many local franchisees. You can choose a recurring fixed-date (bi-weekly or monthly) delivery system, so you never have to worry about making a late night run to the store! Refer your friends and SAVE! And you don’t have to be home for your delivery (although we’d love to catch up on your pet’s latest news! ), as we will leave your pet food at any designated spot (garage, shed, neighbour).